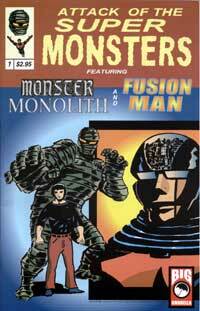 Attack of the Super Monsters (ASM) draws on the rich genre from the B horror movies and earlier EC Comics. Strange coincidences happen to ordinary men and women asking them to become heroes or more. The first story, Monster Monolith, plays on the theme of responsibility and love. The second, Fusion Man plays similar themes but with more focus on heroism and duty. Ted Seko is no recruit to the world of comics. He's Billy Cole's creator, which I had totally forgotten, before receiving this comic. Ducking the padding tendency of modern comic book writers, Seko wrote two tight plotted pulse pounding stories that fortunately, end on a cliff hanger. Although there's some exposition, you will identify quickly with Seko's characters. Since the book is in black and white, Seko makes the best use possible of this by working with extensive ink washes and simple manga-like designs. He has a very good handle on light and dark contrasts. Colours in these stories would probably distract readers from the pages. Seko's work is kinetic. He knows what storytelling is about, even when using simple designs.